For today's "Where are they now?" I will talk a little bit about the man who was the driving force behind much of Sierra On-Line's music during the late 80s and 90s, and who eventually became a game producer in his own right. No, I'm not talking about Ken Allen (although similarly, he too got into producing games after a stint as a composer) but Mark Seibert who was his boss for awhile at Sierra On-Line. So where did Seibert come from and what is he up to nowadays? Unfortunately there isn't too much information about what Seibert got up to in his youth although one thing you probably didn't know about him is that he is a devout Christian. During the late 70s and early 80s, he was a singer and guitarist for a Christian band called "Omega Sunrise" which saw some success in the local charts; they even managed to release a couple of albums! He also helped lead worship services at his church called the Fresno Vineyard during the late 80s and early 90s with his wife Debbie. During the 1980s, Seibert attained a Bachelor of Arts (in Music) at California State University, Fresno, and also started on a second degree in Math in 1986. It was not long after that when in 1987, Seibert responded to a newspaper ad from Sierra On-Line for a composer. Seibert got the job and his first project was editing music on the 1988 game King's Quest IV: The Perils of Rosella. Seibert would go on to work as a composer and music director on several Sierra games from that point onwards, including 1988's Police Quest II, 1989's Quest for Glory (which apparently borrows heavily from the Star Trek theme), 1990's King's Quest V and writing the (in)famous Girl in the Tower for King's Quest VI. During the early 90s, Seibert would take on more of a music director role, overseeing the development of music for games like Space Quest IV, Oil's Well, Police Quest III, Quest for Glory II and multiple VGA remakes. In 1992, Seibert had his first taste in becoming a game producer with the first game he ever produced being released in 1993. It was an edutainment title called Pepper's Adventures in Time and has become a cult classic amongst point 'n' click adventure gamers. Seibert would work as a producer on a few more games such as 1994's King's Quest VII, 1995's Torin's Passage, 1996's Leisure Suit Larry 7 and 1998's King's Quest VIII. Shortly before he left in 2001, the last Sierra titles Seibert worked on were Arcanum and Throne of Darkness which were both released in 2001. After Sierra, Seibert worked for a couple of years as Director of Development at Gentle Revolution Software before working for a few years at Breakaway Games as a Producer/AV Director. While working at Breakaway Games (on games such as the expansion pack to C&C3, Kane's Wrath) Seibert also completed a Masters in Education and in 2008, he left the company and retired from the games development industry for good. Seibert is now a maths teacher at the Perry Hall Christian School in Maryland although the last note he left on his personal website mentioned him working with several composers in the Baltimore area in the hopes of publishing their music in early 2015. Well it's well and truly early 2015 now so hopefully we'll hear from Seibert and his fellow composers soon! 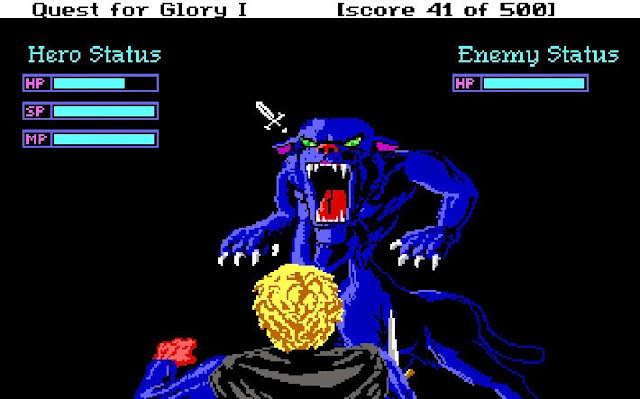 Ken Allen King's Quest Mark Seibert Quest for Glory retro Sierra Space Quest VGM Where are they now?